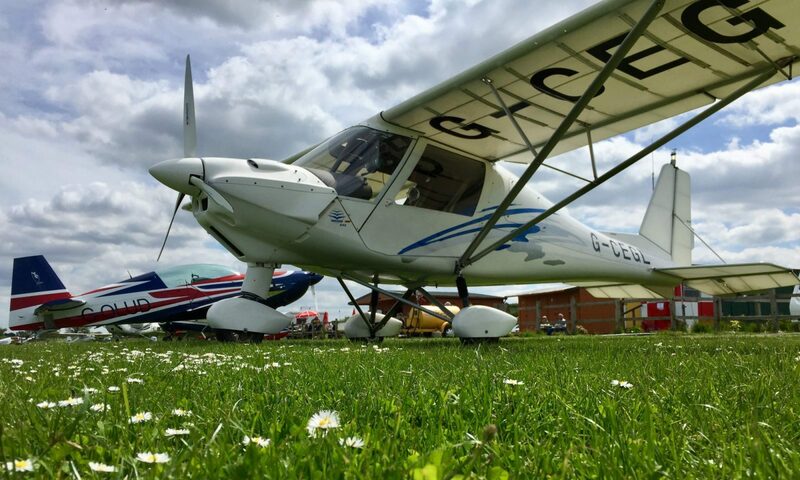 Today we thought we would be brave and visit it a predominantly GA fly-in our C42 Microlight! The Fly-in was at little Snoring an ex RAF base for the Mosquitos (and other aircraft) opened in 1943, sadly only one of the runways remain operational. The fly-in was hosted by the McAully Flying Group who are celebrating their 60th anniversary. Two C42 aircraft from Chatteris flew over and that was 66% of all the microlights there, the other was an EV97 Eurostar. I guess due to the weather there was not as many as was hoped for but there was sufficient planes to make it worthwhile and as with my last two flights and blogs there was more changes in PilotAware and SkyDemon to test, I think I’m get obsessed with this combination now! So there are a number of changes too both pieces of software, but the main items of interest for me today was the PilotAware’s native connection in SkyDemon and a PilotAware patch to fix the issue with not being able to access the internet while connected to PilotAware. The native PilotAware connection in SkyDemon connects a lot quicker the old method of Flam, which took a few seconds and would show “seek satellites” while it connected, the new method seems to connect instantly! And the patch also worked fine allowing us to use live date while navigating. The whole setup for the third consecutive flight remained rock solid. Below you can see the combination showing an aircraft near us (we both took off from the same airfield) it is showing in the main screen and on the traffic radar. The actual flight to Little snoring was uneventful, however the return was to be a fun trip the first C42 return back to Little Snoring so we decided to wait before leaving, eventually a break in the weather came and we confirmed on a couple of weather radar sites that we could fly out and down between two fronts. In a couple of places we were down to 650ft but as the radar had shown we were soon through the worst of it and flying back to Chatteris behind the front that moving through. We were not operating at minima, but the training we had for that was certainly a help as was SkyDemon confirming the presence of obstacles on route well in advance so we could make certain we had good visual contact and this helped lessen the workload in the cockpit. As it turned out if we have wait 3 more hours we would have had a perfectly fine flight back, however in many ways the practice of navigating in low visibility and at low altitude was quite satisfying and Simon who was flying that leg did a great job ably assisted by myself! Yes it was a good team effort in the cockpit, all 4 of us – you, me, SkyDemon and PilotAware.